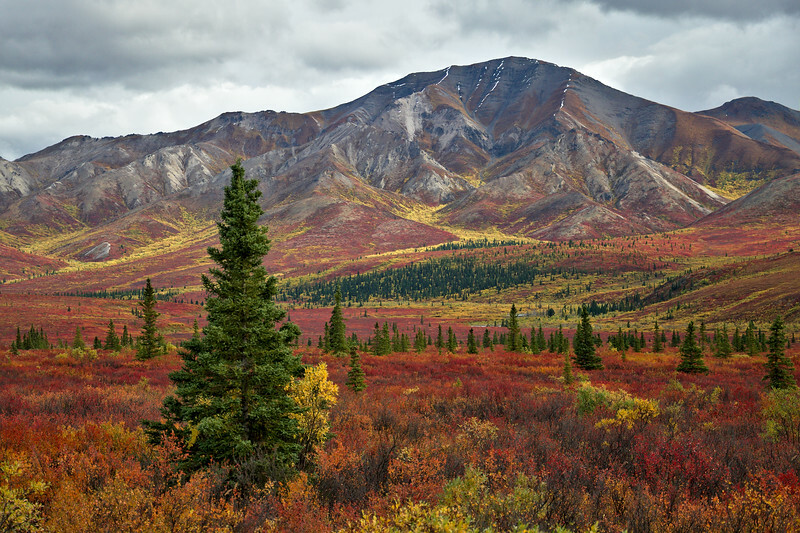 Mountains south of the Park Road in Denali National Park and Preserve. 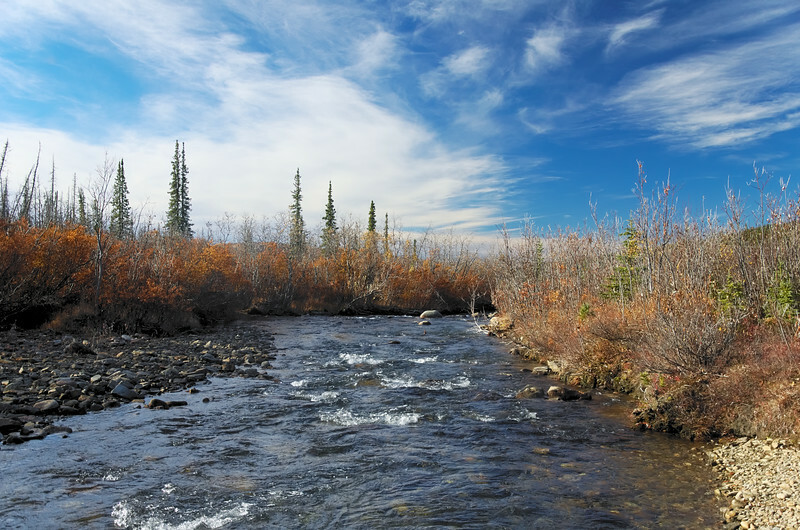 "Rivers" of yellow wind through the red foliage and "lakes" of green spruce dot the hillsides. I have yet to find a place that I would prefer to be in autumn, even though the season here is incredibly short. The splendid colors only hang around for about a week before the deciduous leaves fall, followed shortly by the snow. 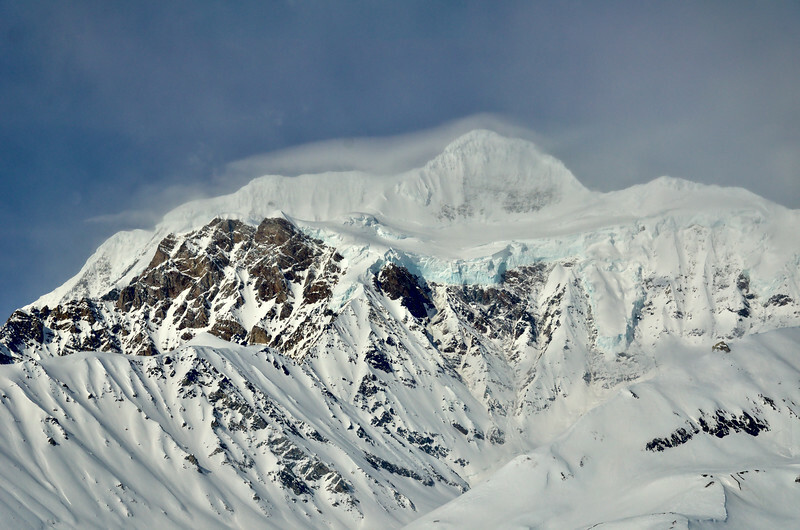 On the Black Rapids Glacier in the Eastern Alaska Range. Eventually the slushy blue streaks in the snow from a few days before this gave way to water channels in the ice beneath the surface. Sometimes they find old channels from previous years, sometimes they don't. 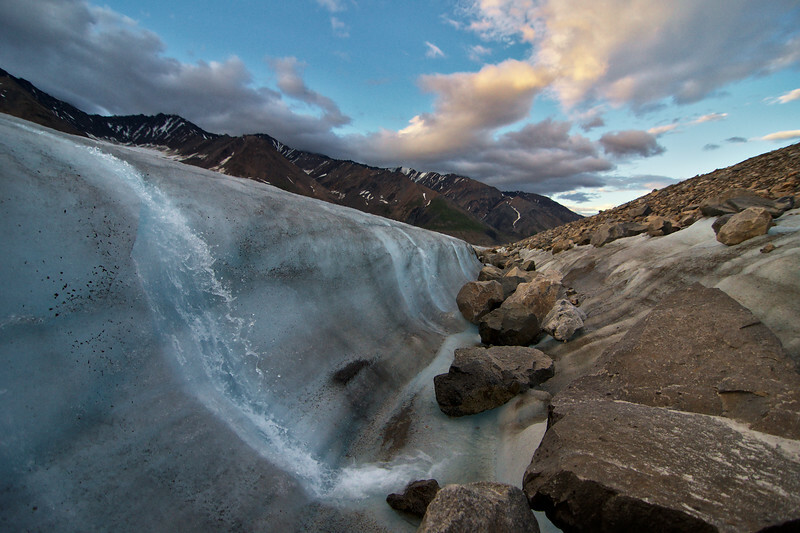 In the summer of 2014 we spent two weeks camped on the glacier and had to cross many of these streams. It was still early in the melt season which meant that there weren't any moulins yet to drain the water for the surface. This meant that to get across the glacier we had to jump over many of these streams, a handful of which were quite wide. My knees would often be swollen and sore at the end of the day. I was always more comfortable jumping to my dominant, right leg, but when I didn't mix it up I paid for it later. I started jumping all the small streams to my left leg, and only to my right if there were consequences for missing a jump. The pastels turn fiery as the Sun nears the horizon. 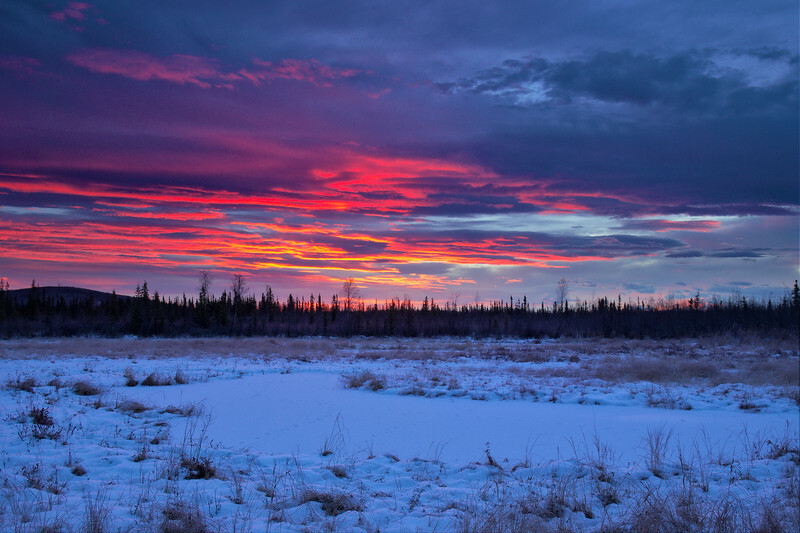 Taken on the Alaska Dog Musher's Association trail system on the Creamer's Field Migratory Bird Refuge. It's sunrises like these that keep me going in the dark winter here. 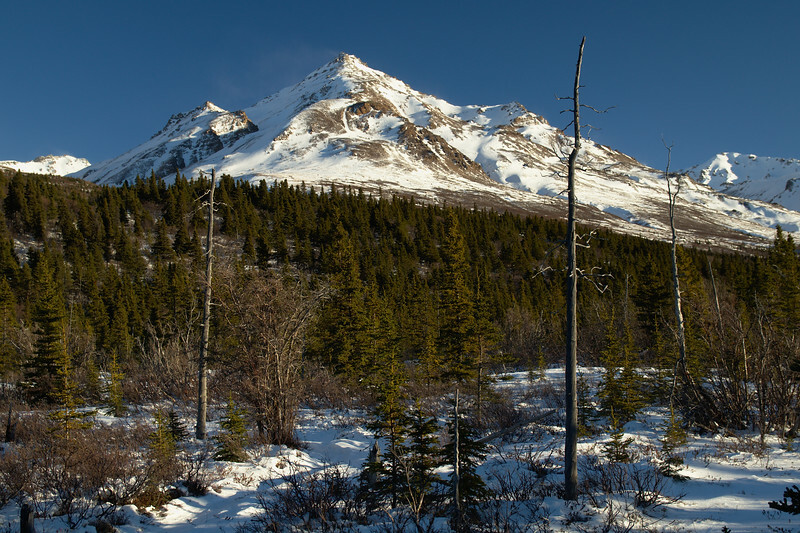 Across the Richardson Highway from the Donnelly Creek Campground. 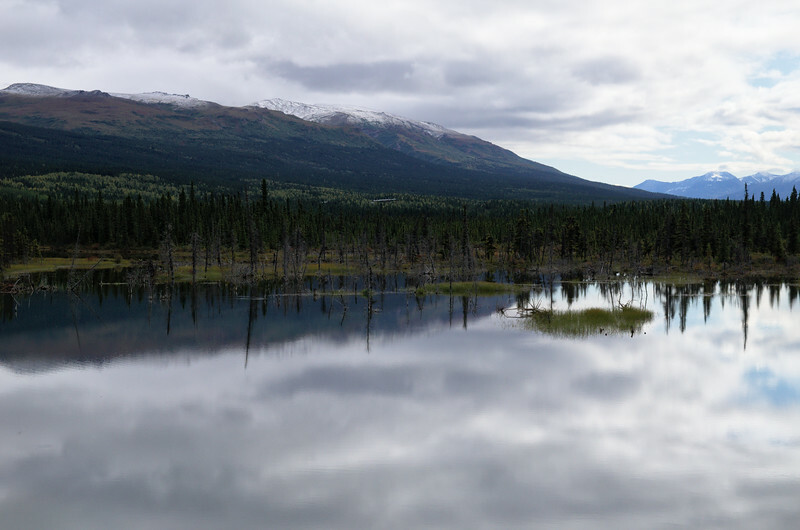 Possibly the calmest weather I've ever seen in this part of the Alaska Range. Wind is often funneled through Isabel Pass from the south, so it's not often I see flat water here. 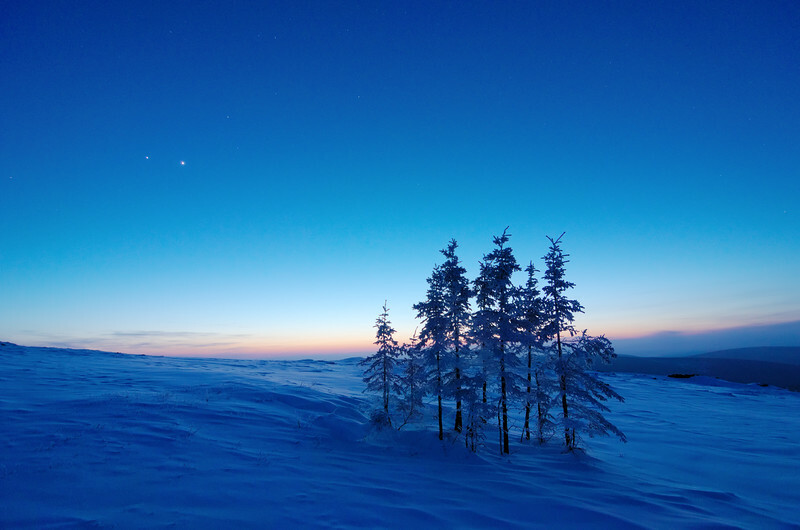 Jupiter and Venus shining bright after sunset as twilight takes over on a cold, cold night on Murphy Dome. 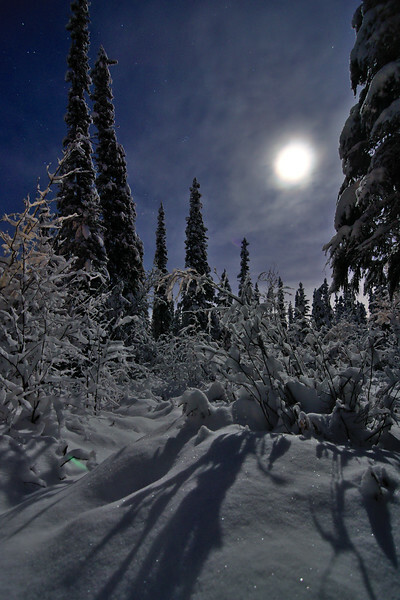 The "blue hour" lasts a very long time in the interior of Alaska for most of the fall, winter, and spring. There were quite a few large streams to cross on the Black Rapids Glacier this year with absolutely no englacial drainage to help reduce the water at the surface. At least they are pretty to look at. The channel here was quite a bit deeper and wider than it looked and this little island of ice with the precariously balanced boulder proved to be a useful crossing point. A month earlier this landscape was vibrant green. 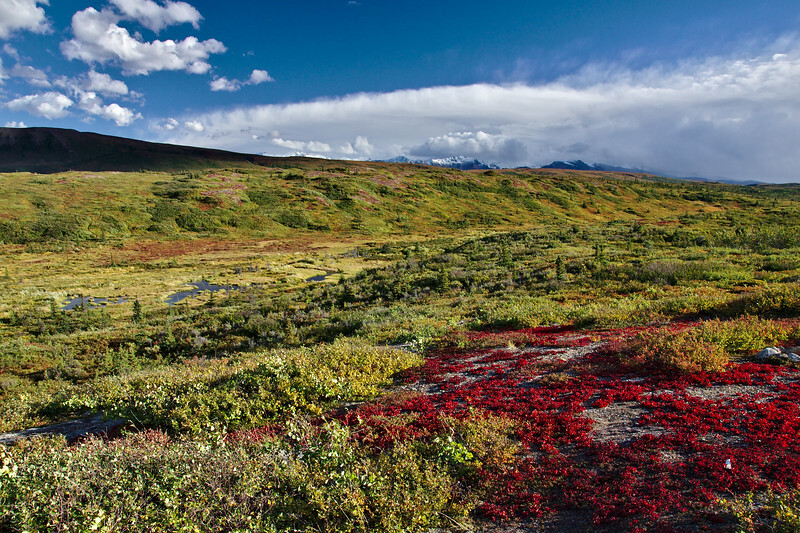 Over the course of a single day I could witness the tundra reddening. Slowly, the bright scenery becomes muted by orange, red, and gold shining through the remaining spruce, willow and alder leaves, and grasses. The clouds and rain are held back by the Alaska Range, although the wind still howls through with occasional 60 mph gusts. The hills are beautiful and I just want to sit and watch the brush blow in the wind. 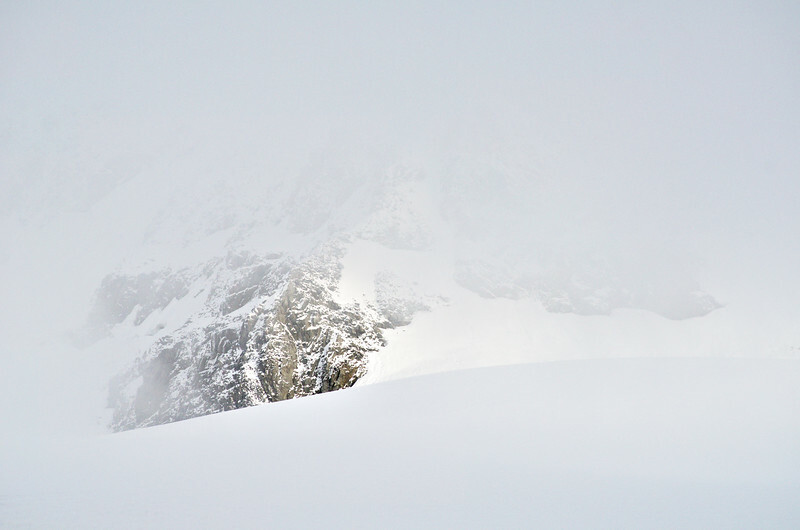 Even short-lived whiteout conditions on mountains and glaciers are incredibly disorienting. Everything becomes, simply, void. When fog comes in with snow there are times you can't see your own feet. It's best not to even try to travel at all when possible. The shuttle buses in Denali National Park stop constantly for wildlife, this is one of the few stops that is made purely for the view. Braded rivers, kettle ponds, and glacial erratics dot the valley. This was one of the only days I've been there that the glaciers were visible. 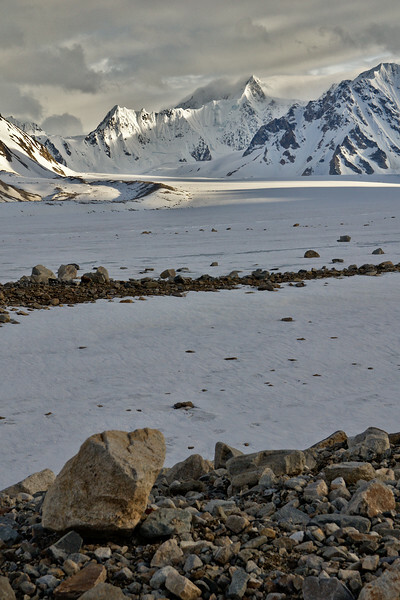 Rocky moraine on the Black Rapids Glacier in the Eastern Alaska Range. You'd barely know there was 8 inches of fresh snow just a few days before. June 2014. 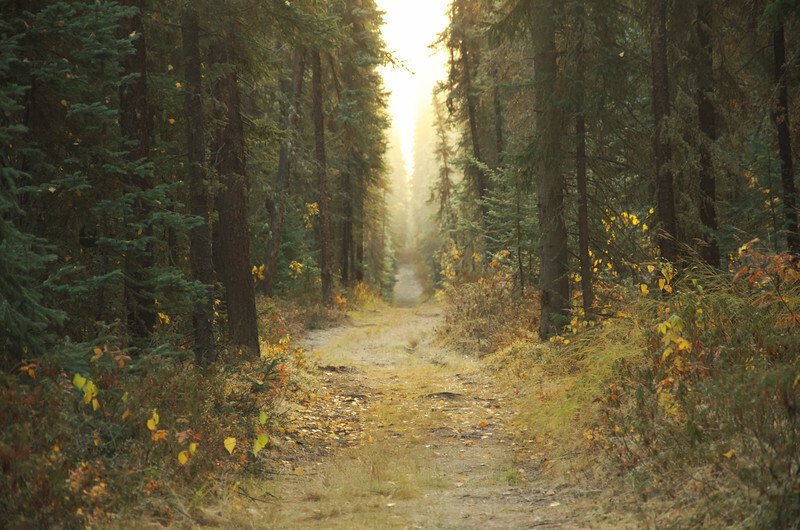 The sunrise and a bit of fog made for a cool effect down the straight, spruce lined trails. This is out on the trail system at the University of Alaska Fairbanks. 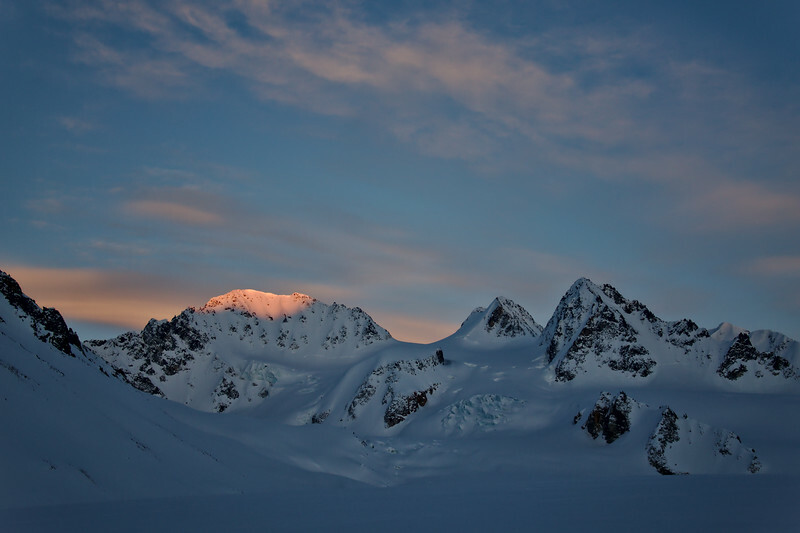 Alpenglow disappears slowly on a peak in the Alaska Range. 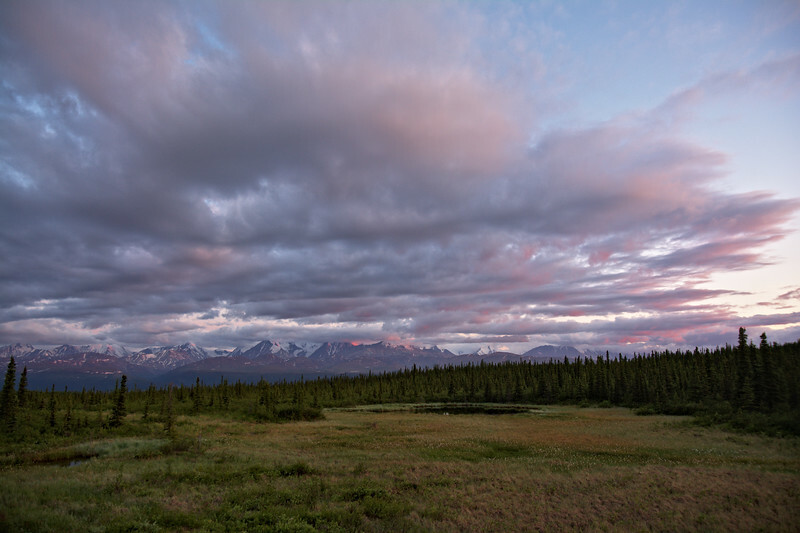 Incredible pastels filled the sky and glance a few of the higher ridges and peaks during the "blue hour". Mt. 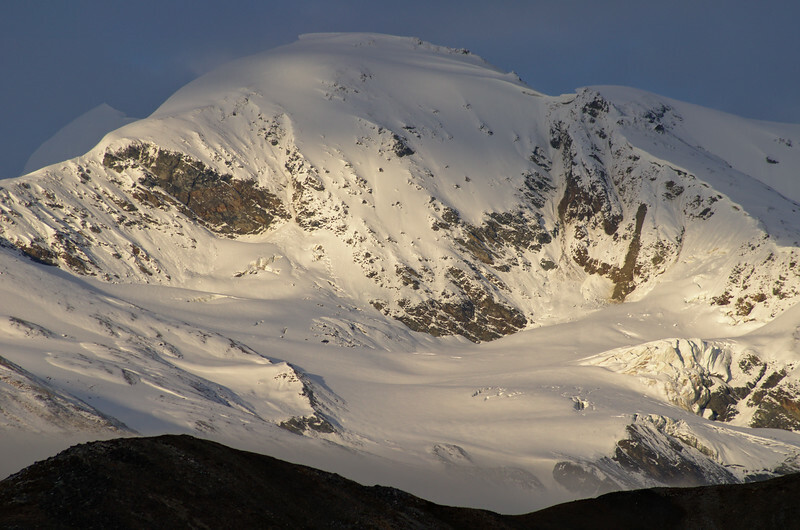 Shand (12,660 feet, 3859 meters) in the Alaska Range - beautiful in the sunlight! 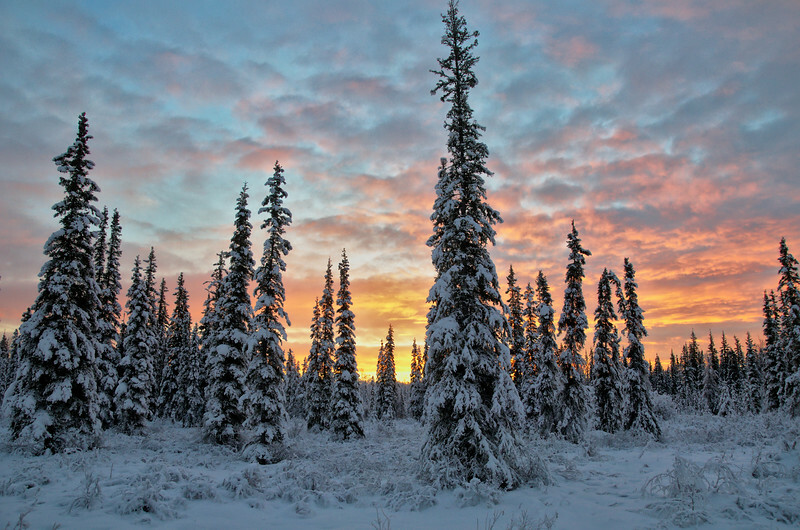 Snow-clad spruce trees at sunrise. 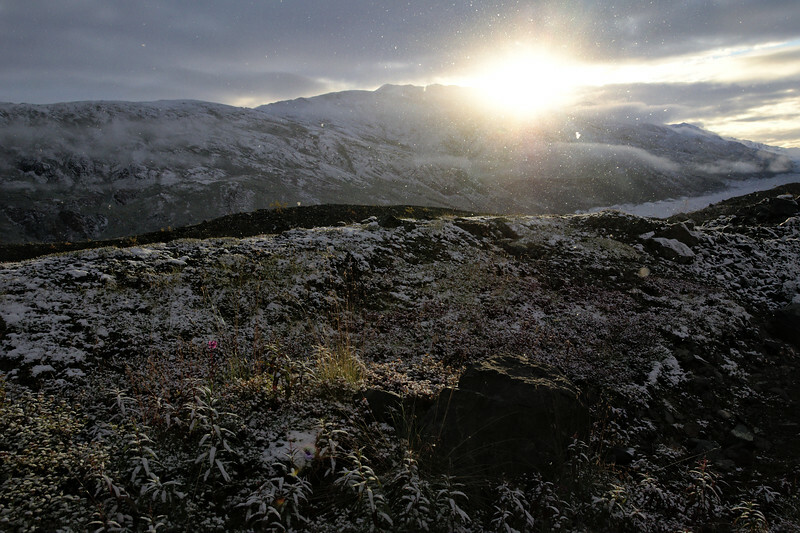 Sunrises have to be one of my favorite things about Fairbanks, next to the aurora, and the mountain range to our south. 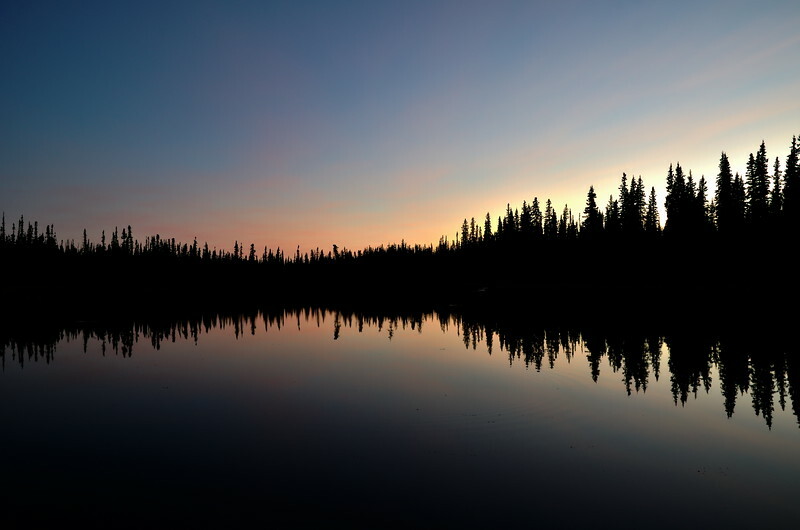 Our sparse boreal forests give nice open views of the sky too. I love seeing those subtle arctic blues behind the brilliant colors. Almost every morning in the winter is wonderful! 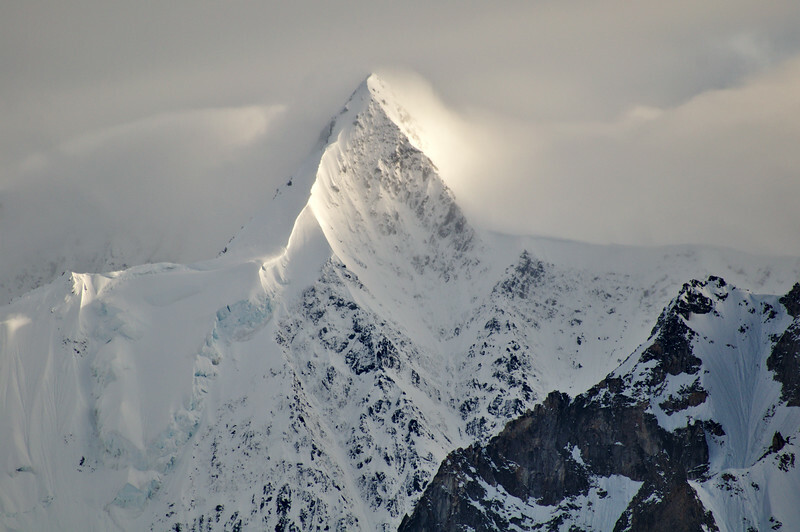 McGinnis Peak in the eastern Alaska Range. 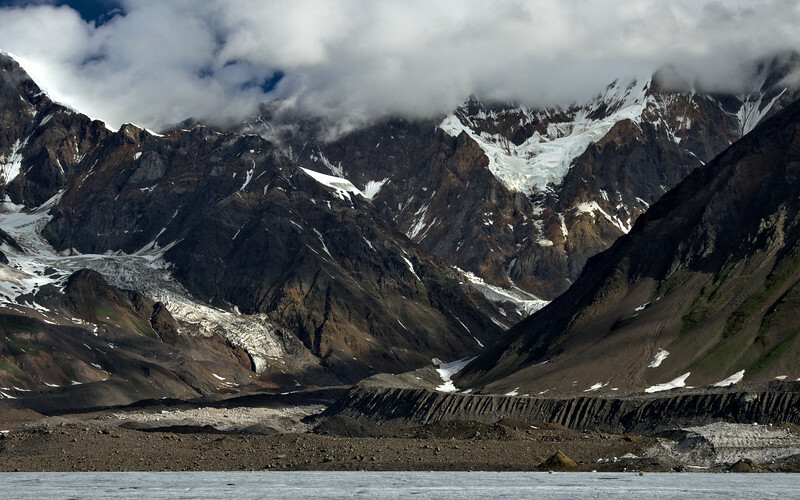 The glacier and icefalls at it's southern base flow into the Black Rapids Glacier. 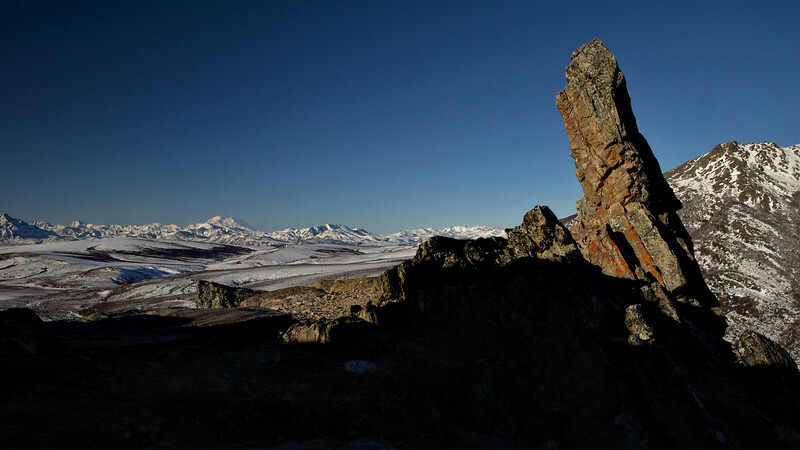 Scattered across the surface are numerous large rocks, some part of moraines, some deposited during large falls or landslides. Evening light hitting peaks in the Alaska Range. Walking across the tussock-filled tundra, every once in a while we would kick up a flock of swallows. This was taken as we were walking back to our campsite after wandering around the ridge for a while. What a wonderful way to end a long day of hiking! 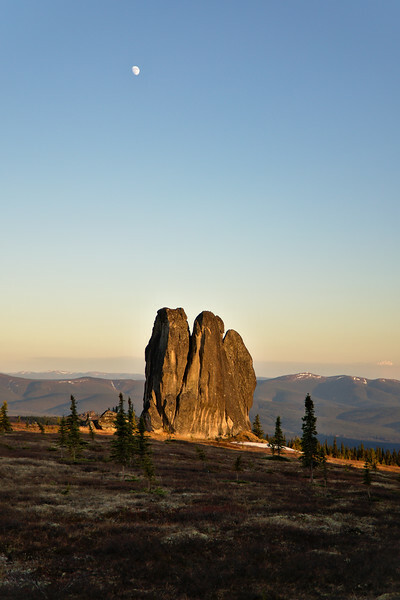 The Granite Tors is a really awesome place; a 15 mile loop trail that is accessed from Chena Hot Springs Road. 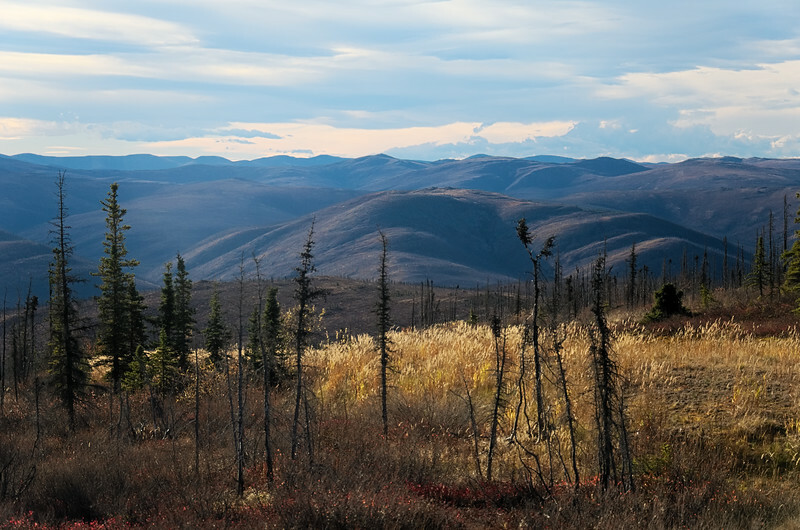 Taken during a late autumn drive into the White Mountains of the Alaska Interior for a dayhike. 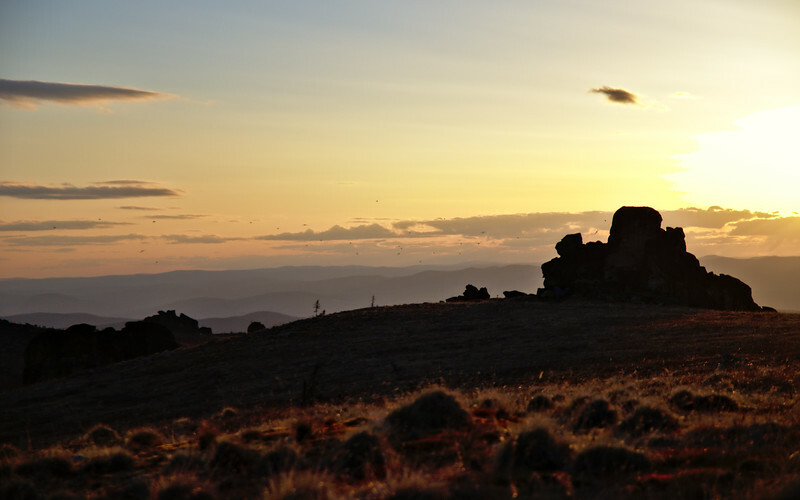 The White Mountain Recreation Area is incredibly remote, but littered with trails for hiking, snow machining, and skiing. 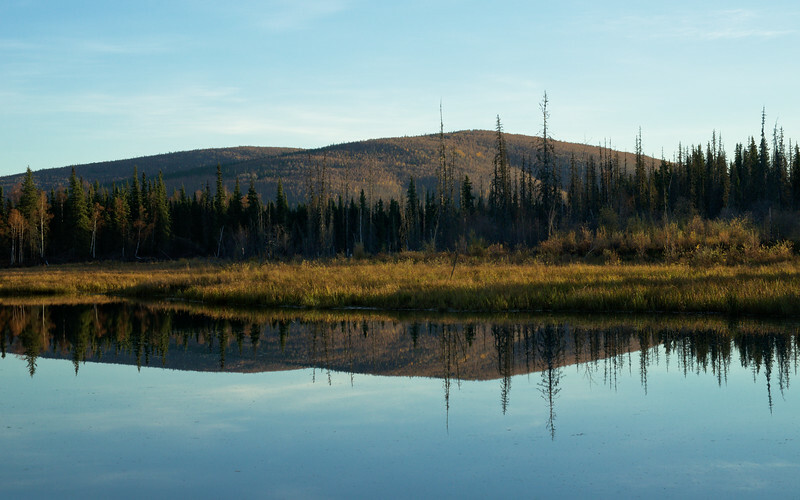 Bordered by the Steese and Elliot Highways the rest of the 1 million acre rec area must be accessed by a handful of mining roads and by trail. 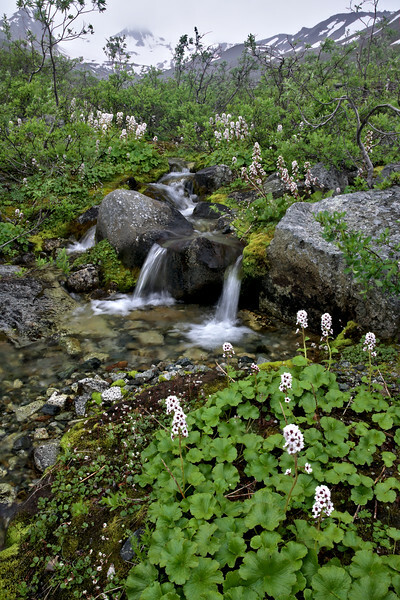 We stumbled on this really beautiful stream up above the Canwell Glacier in the Alaska Range. It's too bad that it turned out to not get us where we wanted to go, but it was a nice distraction. 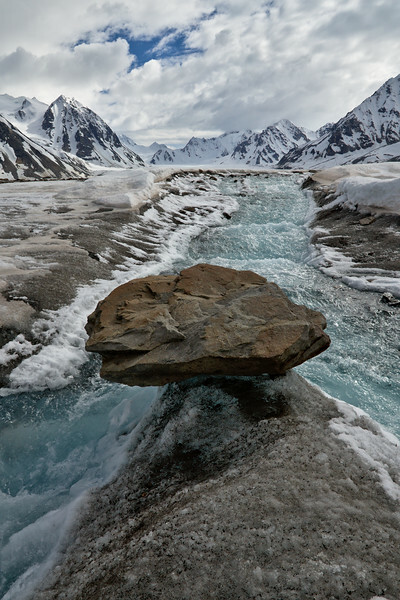 Cauldron-like depressions called potholes are scattered around the upper reaches of the Black Rapids Glacier. 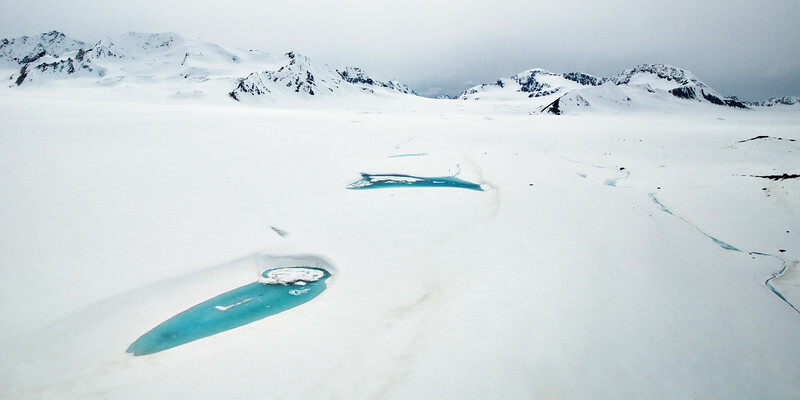 They often fill with water over the summer, eventually draining on the surface or subglacially. They are left-over remnants of crevasses that formed during the 1936-1937 surge of Black Rapids. 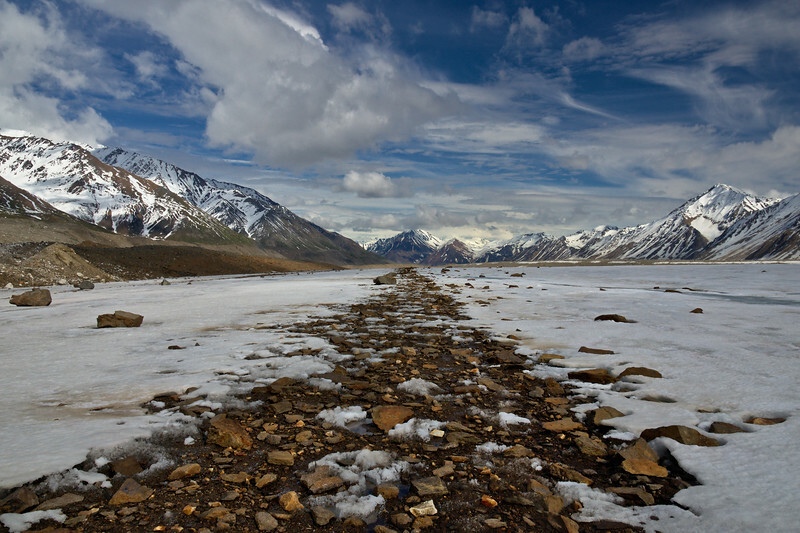 During the surge the glacier terminus advanced by about 3 miles and earned the nickname the "galloping glacier". Taken June 13, 2014. Oh, thanks for the snow! How many seasons can you count in this photo? 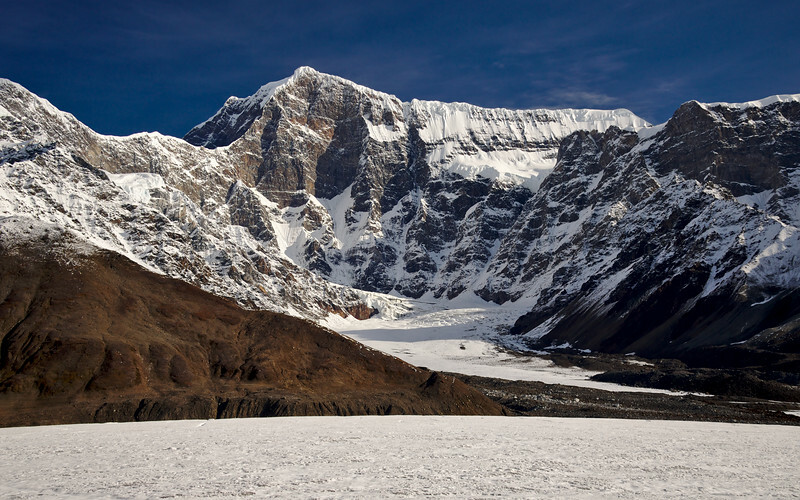 This is the terminus of the Canwell Glacier in the Alaska Range - east of the Richardson Highway. Taken August 31, 2014. 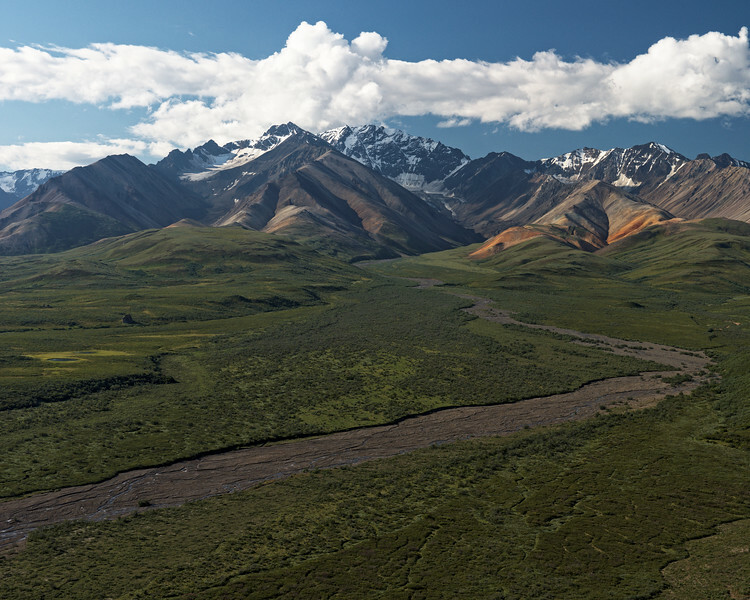 Denali National Park has one of the most varied landscapes of anywhere I've ever been. Scenery changes drastically and quickly almost anywhere you go in the park. 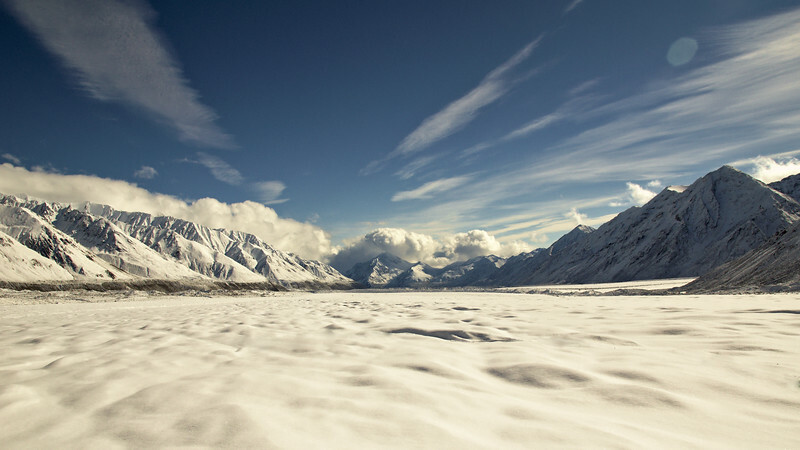 You can walk out of a thick boreal forest to find yourself in desert tundra or follow braided rivers onto glaciers and high mountains. 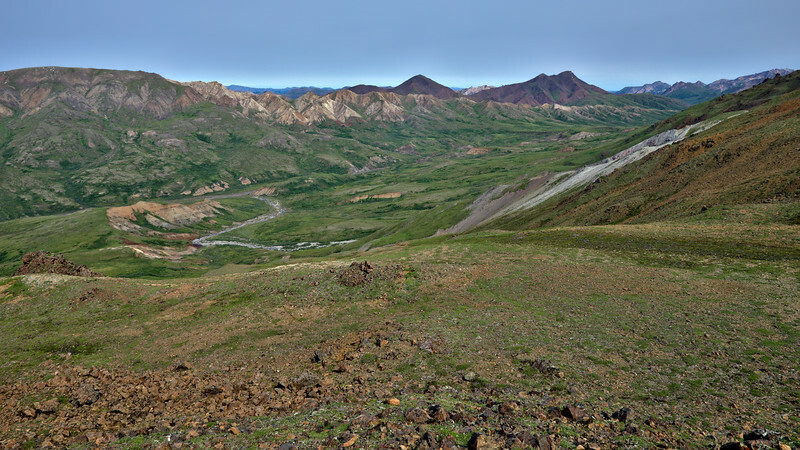 This is the view to the north and east from the Thoro Ridge, a bit west of the Alpine Trail near the Eielson Visitor Center. 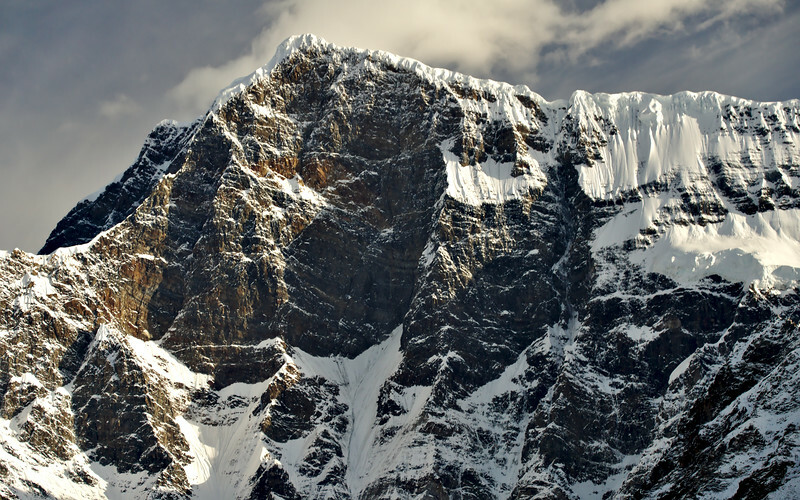 The south face of Mt. 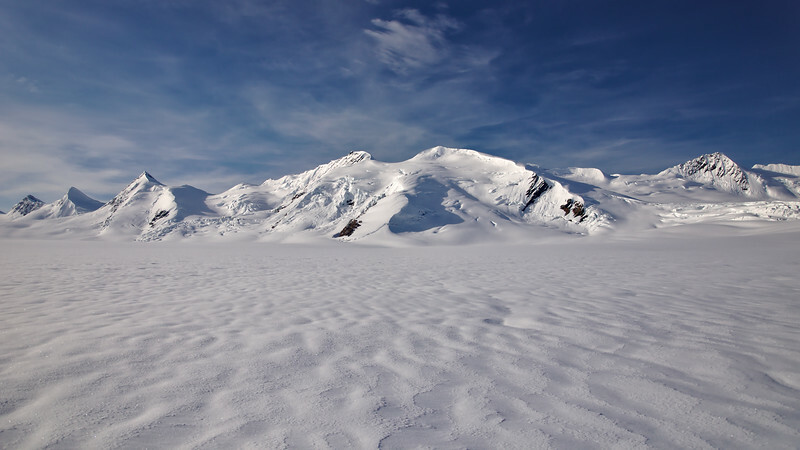 Shand (12,660 feet, 3859 meters) in the Alaska Range. That's about a mile of vertical, exposed rock. 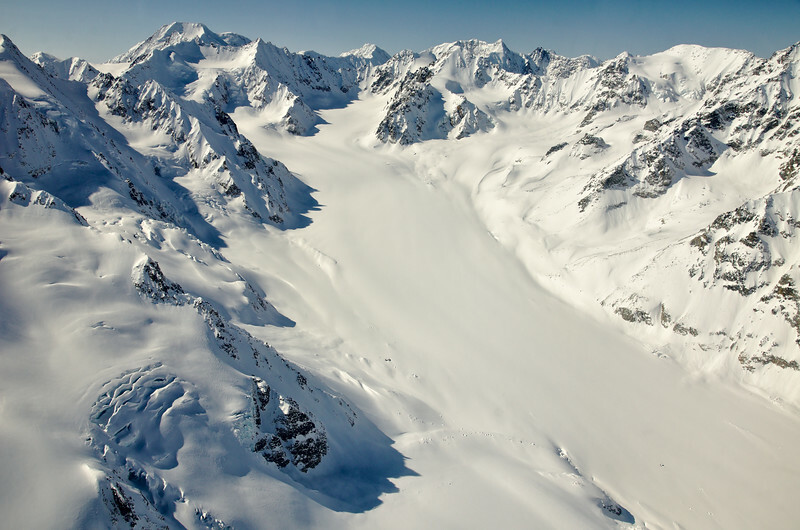 Flying over the Loket tributary to the Black Rapids Glacier in the Alaska Range in the Turbine Otter. This was the location of our campsite for a week in April 2013. It was quite a bit colder and windier than the previous year - like 60mph winds at -20 degrees F cold. 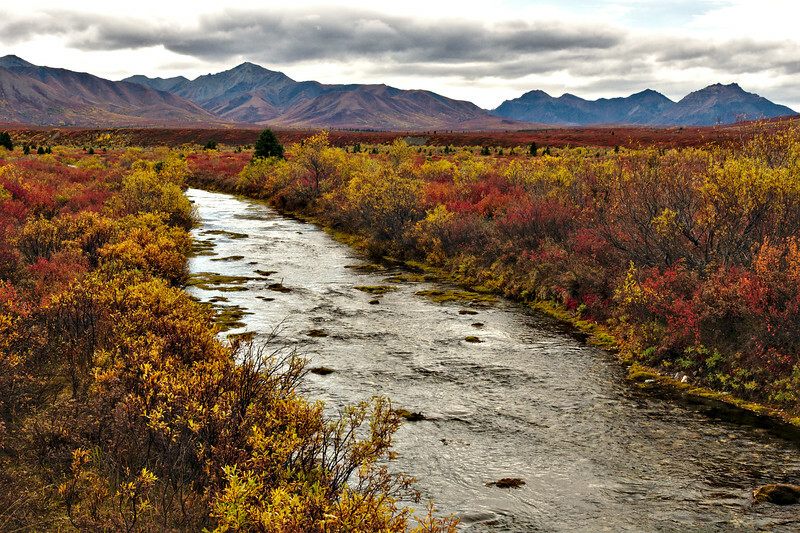 Fall colors along the Savage River in Denali National Park and Preserve. Overlook on US Creek Road, White Mountains, AK. 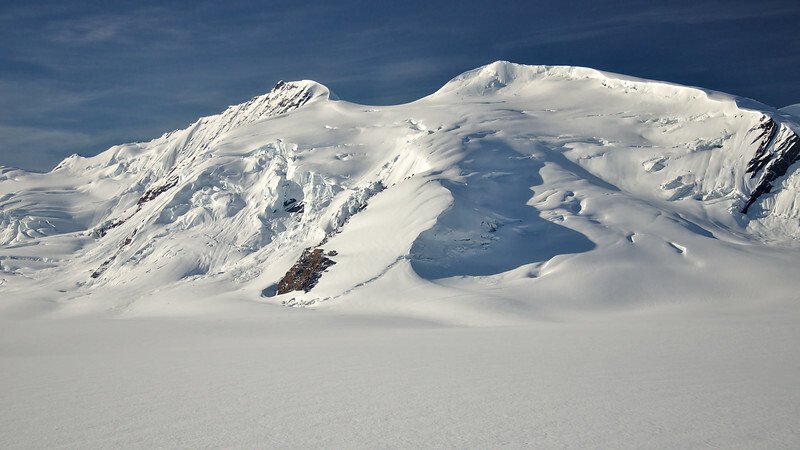 Surface of the Black Rapids Glacier covered in 6 inches of fresh snow from the night before. The weather was gorgeous, but it looked like it could turn at any moment. 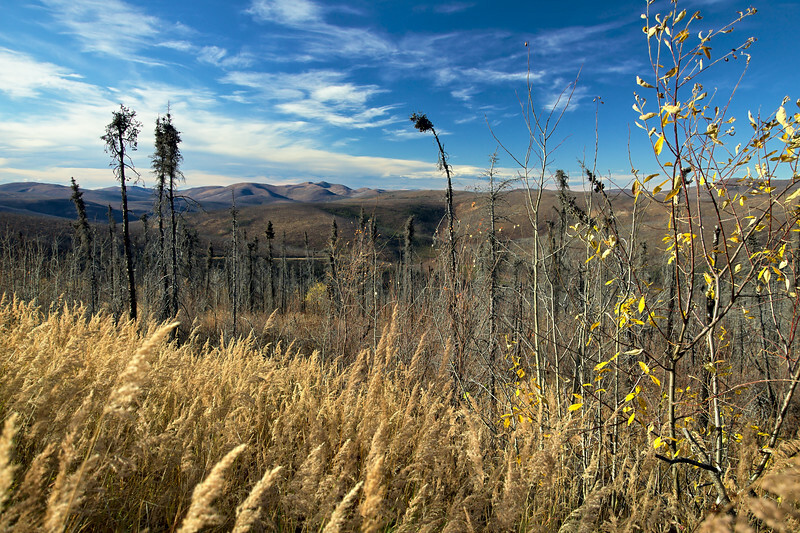 The Hills along Chena Hot Springs Road outside of Fairbanks, Alaska after most of the leaves have already fallen. 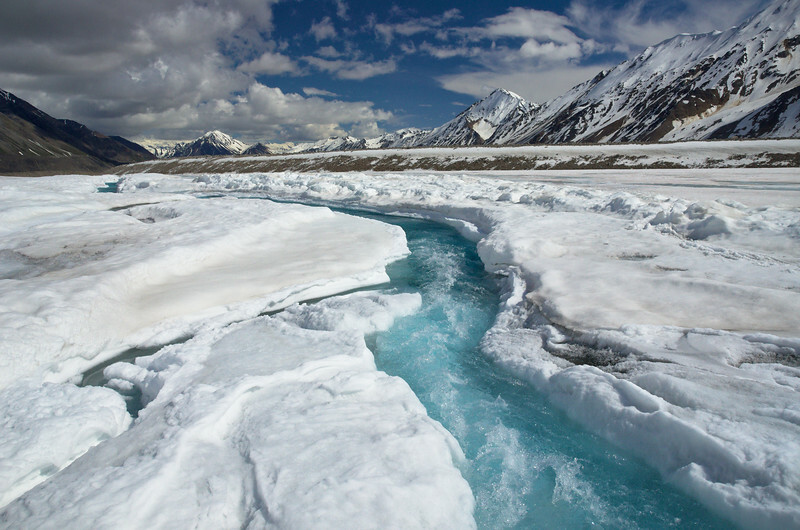 Surface stream near a moraine on the Black Rapids Glacier in the Alaska Range. 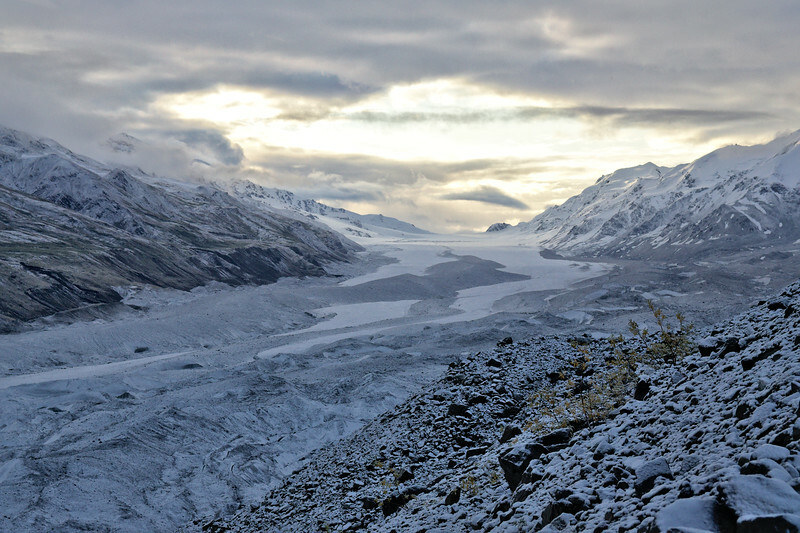 Valley glacier tucked away above the Loket Tributary. It's located close to our GPS base station. It was tough trying to figure out what the weather was going to do. 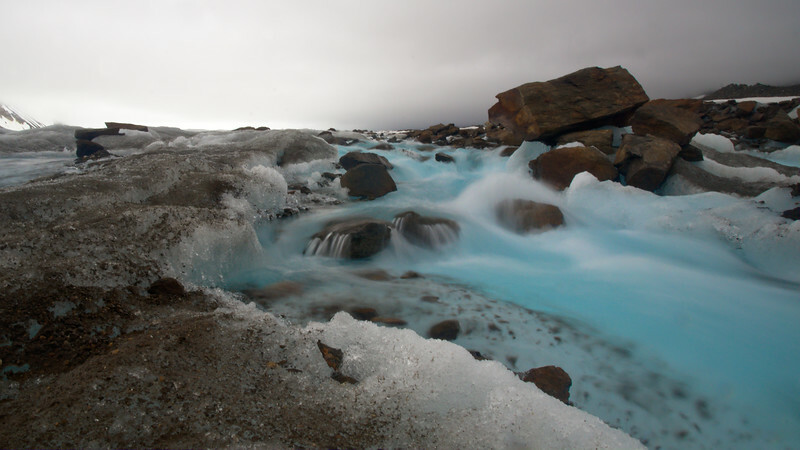 Water flows from the surface of the Black Rapids Glacier into a channel along a medial moraine. A few meters upstream a large moulin was draining the bulk of the water that had originally carved this passage that was a little bit over my head. 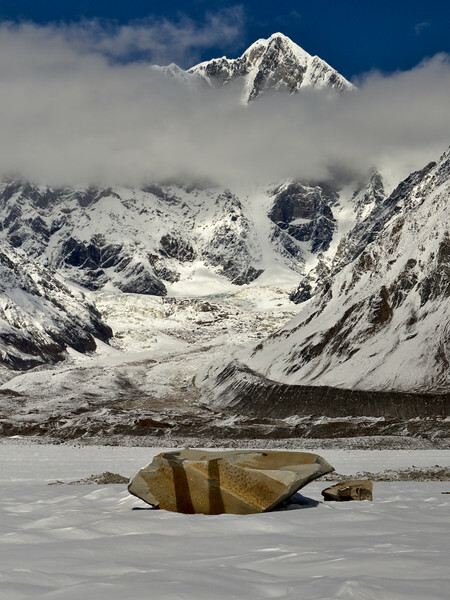 Tall cumulus clouds can create such dramatic contrast against steep mountainsides. The lighting is so dynamic as the shadows crawl over the landscape, the glaciers, moraines, and icefalls - every second the scene changes. 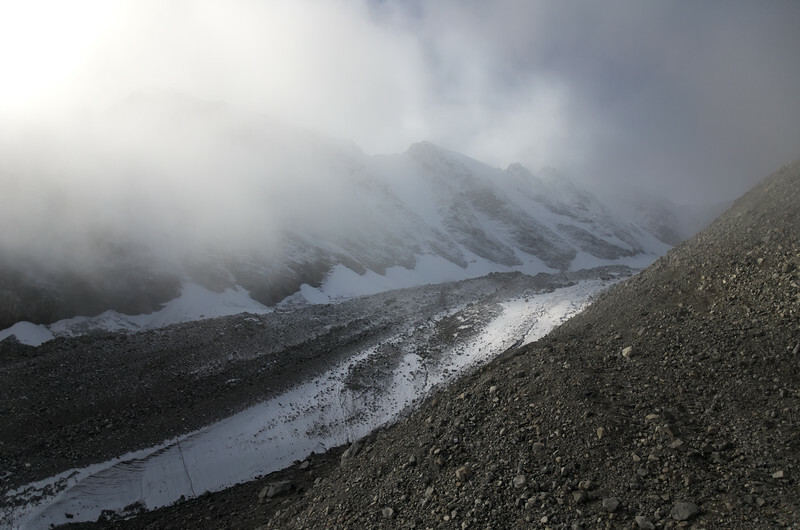 Looking at the south wall of McGinnis Peak from across the Black Rapids Glacier. 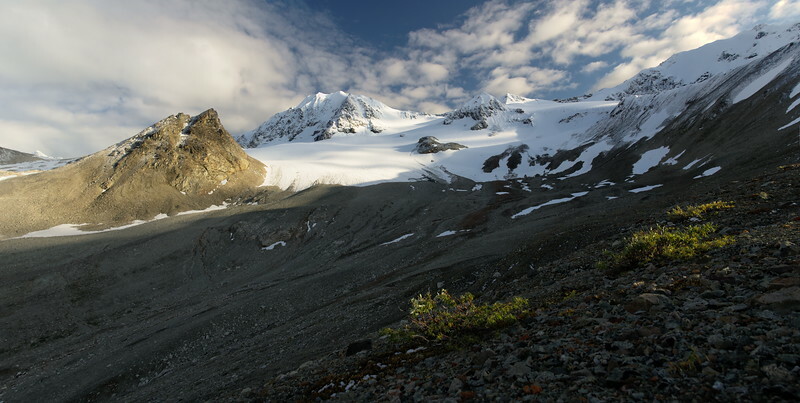 The peaks to the west of the Jarvis Glacier and behind the Lodge at Black Rapids to the east of the Richardson Highway. It's a pretty dismal winter for snow, but a beautiful, very windy day for hiking. 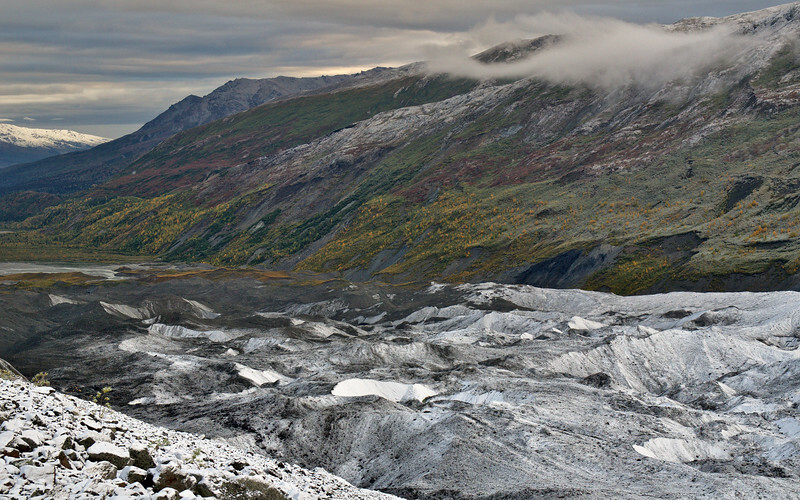 Mountains covered in ice and a dusting of fresh snow in the Trinity Basin, high up in the Alaska Range. 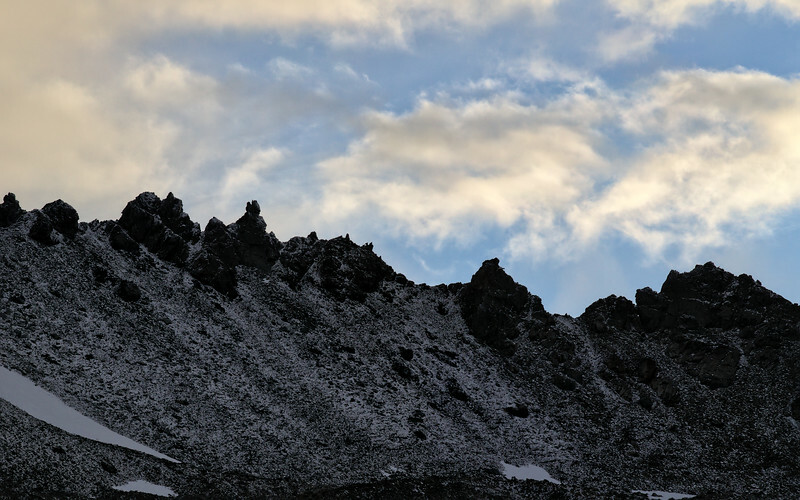 Just another peak in the Alaska Range. Beautiful evening light, but unfortunately it was one storm after another. We get a little bit of blue sky for an afternoon and then the clouds move in over the mountains to the south.